The TruckNet UK Drivers RoundTable • View topic - Peter Slater Ltd.+ Other Coalmen from the 50s/60s onwards. Peter Slater Ltd.+ Other Coalmen from the 50s/60s onwards. Right then lads how many of you can remember these in the 50s/60s the coal men from yorkshire. Last edited by Stanfield on Sat Jul 08, 2017 12:01 am, edited 5 times in total. 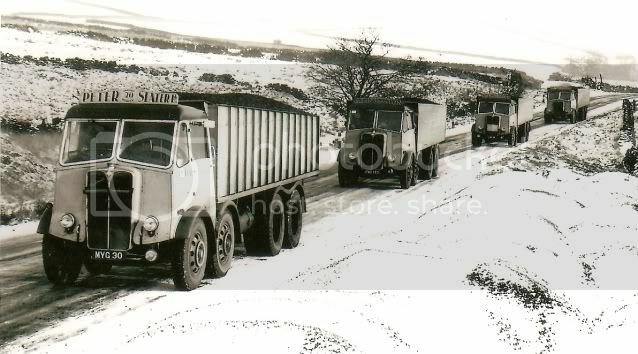 I think this pic was taken on the A57 at Moscar between Sheffield and Ladybower maybe they were running coal to Hope cement works. Last edited by Stanfield on Sat Jul 08, 2017 12:03 am, edited 2 times in total. The first three photos I have just purchased and on the back were copyright to Camlyn Photos, the fourth is from a collection of Motorcards by Bellingham I purchased some years ago, thats why I have watermarked them. Heres one of the crew that chased Slaters over the yorkshire moors. Last edited by Stanfield on Sat Jul 08, 2017 12:09 am, edited 3 times in total. Aye,she'll not be like that for long.Great picture. The Mullans photo was taken at Lady's Bridge Sheffield,and there's an Atlas Express Ford Thames behind,if they are both going over Woodhead that Atlas driver will have all on catching Mullan going down t'other side. Hi John,they are a blast from the past - NCC Ollerton,was it the National Carbonising Company with a trade name of "Rexco"or summat like that and who was the main contractor for them,I've seen a photo somewhere which may have been yours of their fleet lined up in their yard.And Smiles for Miles,I remember them running out of the North-East coking plants,Derwenthaugh,Norwood and Monckton Jarrow spring to mind. I reckon that Atki of Smiles is ex Hanson,Wakefield going by the reg. Chris Webb wrote: Hi John,they are a blast from the past - NCC Ollerton,was it the National Carbonising Company with a trade name of "Rexco"or summat like that and who was the main contractor for them,I've seen a photo somewhere which may have been yours of their fleet lined up in their yard.And Smiles for Miles,I remember them running out of the North-East coking plants,Derwenthaugh,Norwood and Monckton Jarrow spring to mind. Hello Chris it was National Carbonizing Co Ltd (Rexco), the main haulier was J Clarke (Haulage) Ltd of Ollerton who NCC owned, I think all their vehicles ran on B licence, below is an application to add vehicles to a B various licence in the East Midlands from February 1965. Thanks John,they ran in a green livery,mostly if not all Atkinsons,a bit like Hansons from Wakefield? They were a regular sight on the A1 and the A616 from Ollerton to Sheffield via Barlborough in the dark ages . Them days are long gone,who would have thought that the NCC plant would have gone so quickly just like a lot of the coal industry sites. From the Nottingham Area.Egro cabbed Leyland Octopus G reg 1968/69 fully freighted. Last edited by Stanfield on Sat Jul 08, 2017 12:22 am, edited 2 times in total. This photo of E F Beattie's AEC was found by TIPIT..During the 60s Beattie use to haul coal from the yorkshire pits (wingerworth) back to there depot in Bennett St Ardwick Green M/C. Horace Kendricks another big haulier in the movement of coal during the 60s.But sadly all gone thanks to Maggie. Last edited by Stanfield on Sat Jul 08, 2017 12:26 am, edited 2 times in total. I remember Beatties running out of Wingerworth and Horace "greedy board" Kendrick was a familiar sight especially in South Wales running coke into the Midlands.Another company from Walsall was Oscar W Johnson who did the same work as Horace,anybody remember him? I'm sure Flatman John sent me this,hope he doesn't mind me posting it.A line-up of Clarkes wagons when on the NCC "Rexco" job. Carrying on with the coalmen here's some more. The famous Oliver Hart & Sons from Coppull Lancs.Leyland Octopus. This Vulcan owned by Samuel Hibbert of Oldham was driven by my father in laws, Father during the 50s. Last edited by Stanfield on Sat Jul 08, 2017 10:42 am, edited 3 times in total. i remember back in the late 60's early 70's when my father worked for hansons & we lived in royston (barnsley) & as kids we used to see all the (mainly) hansons tippers going past our housing estate,their must have been one going past every couple of minutes going to monkton coking plant.only seems like yesterday,where does time go..? 164480 wrote: i remember back in the late 60's early 70's when my father worked for hansons & we lived in royston (barnsley) & as kids we used to see all the (mainly) hansons tippers going past our housing estate,their must have been one going past every couple of minutes going to monkton coking plant.only seems like yesterday,where does time go..? Juyt had a google and Monckton C and C has belonged to Hargreaves Group since 2005.I read somewhere that coal goes by rail from Monckton to Maltby pit for blending but not sure if any goes by road. as far as i know it still goes by road,i did a few loads a couple of times for a tipper firm i used to work for a few years ago.if its the Armitages im thinking of they were based at carlton. the Armitage I'm thinking of were in a brown colour and had some flats in Tinsley Wire Sheffield,ran DAFs IIRC and used to chase about a bit.Maybe there was another Armitage Andy? the ones im on about also had daf's but they were blue,i don't remember any Armitage in royston. Last edited by Stanfield on Sat Jul 08, 2017 10:46 am, edited 3 times in total. Gilbraith,Imperial,& just in the last few month the Stiller group. Last edited by Stanfield on Sat Jul 08, 2017 10:48 am, edited 2 times in total. Thanks for that one, I never knew Kendricks ran any artics. Saw 8 leggers most days years ago but never any artics. Don't take life too seriously, you'll never get out of it alive anyway. Can't be sure of the numbers but Kendricks towards the end of their days ran loads of artics, I remember them having a lot of Fodens with the huge headlights (S83 was it?). I remember a brand new unit & trailer tipping over in Bilston steelworks on its first trip, first load of coke, a few hours old! Trev_H wrote: Can't be sure of the numbers but Kendricks towards the end of their days ran loads of artics, I remember them having a lot of Fodens with the huge headlights (S83 was it?). I remember a brand new unit & trailer tipping over in Bilston steelworks on its first trip, first load of coke, a few hours old! Bit of a surprise that, as I said I never saw any artics. I worked for Coopers in Swindon for a while, and the 8 leggers were always in there back loading, or they were tipping swarf at coopers Sharpness yard. After I left Coopers I was always seeing Kendricks on the road, but never artics. People used to tell me I needed my eyes tested, I think they may have been right!!!!!!!!!!!!!! Another company who played a big part in the movement of Yorkshire coal. Hansons of Wakefield,I remember them best when they were in their green livery,before they bought Longsons. One here .National Coal Board Foden. Last edited by Stanfield on Sat Jul 08, 2017 10:53 am, edited 3 times in total. 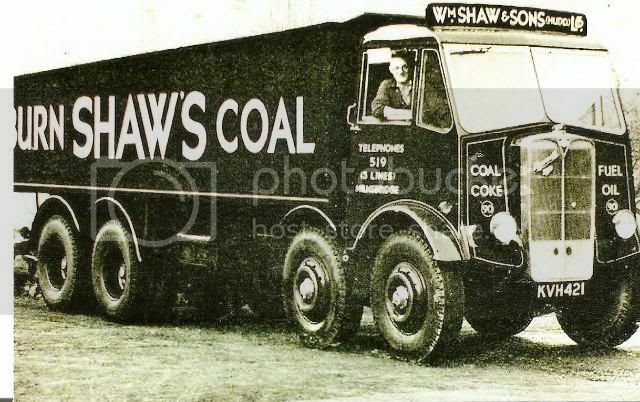 Another one of Shaws,an AEC MK2 Mammoth Major.